When will be Steve Harvey's Funderdome next episode air date? Is Steve Harvey's Funderdome renewed or cancelled? Where to countdown Steve Harvey's Funderdome air dates? 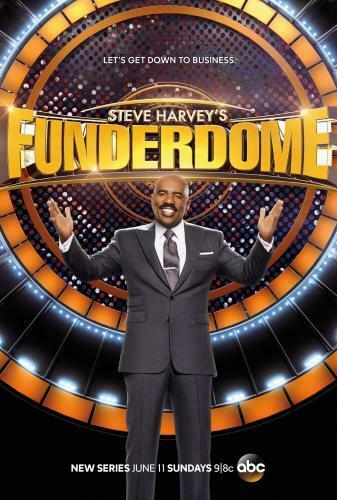 Is Steve Harvey's Funderdome worth watching? The inimitable Steve Harvey is hosting a new, groundbreaking show on ABC, Steve Harvey's Funderdome looking for great innovators and entrepreneurs to help fund their American dream. We're looking for mom and pop businesses, unique and interesting products, or creative ideas that just need a little more money to jumpstart their next phase. You could win anywhere from $10,000 - $100,000, all you have to do is win over the live studio audience and convince them that you deserve to be funded. Inventions include a hands-free hose holder; hair blinger; easy-to-carry laundry basket/laundry bag combo; a way to prevent dirty rings around collars; utensils that make it fun for children to eat; scissors designed at an angle. A panini press that grills the face of Jesus Christ into a sandwich; a pie that's the size of a cookie; a large microfiber towel; giant, individually packaged wet wipes; indoor/outdoor pet enclosure; shoes that allow women to adjust heel height. Inventions include a sandwich in a can, a combination beach towel/pillow, a bowl that allows pets to enjoy the smell of people food; a dog food that uses crickets as a protein source, an app for truck drivers and a portable recording studio. Steve Harvey's Funderdome next episode air date provides TVMaze for you. EpisoDate.com is your TV show guide to Countdown Steve Harvey's Funderdome Episode Air Dates and to stay in touch with Steve Harvey's Funderdome next episode Air Date and your others favorite TV Shows. Add the shows you like to a "Watchlist" and let the site take it from there.